LiverpoolLashes Beauty Blog: Dry Lips... Solved! So to match my dry hands, face etc... I have now developed dry chapped lips! Oh the joys of winter! I wasn't worried too much as I have my trusty Carmex Lip Balm Tube. 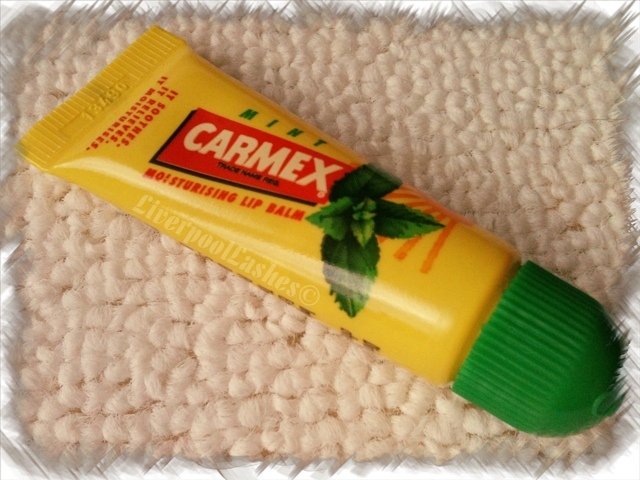 I am a massive fan of Carmex since a friend introduced me to it a few years ago claiming "it's the best lip balm EVER!" I bought a pot of it (to which I'm too embarrassed to photograph since it looks like it's been through a war!) and I have since purchased the cherry version in a tube and now the mint version. I bought the mint one from Tesco as this flavour was on offer and truth be known I have had a little bit of a "thing" for mint lip balm since using the little Urban Decay Naked Mini Tube that I got with the Naked2 palette. Now I love Carmex in any form but I have to say I'm not loving the mint version as much. There's something about it that I'm not enjoying and I wish I could put my finger on it... I'm thinking that it's too minty (Is that ridiculous?!) I think that the flavour / scent is too strong and overpowering. It sort of makes your breath feel fresh but the issue I have is the minty mentholness (is that a word - nope as I now have a red line underneath!) makes your lips tingle so much that for me personally I find it difficult to concentrate on anything else so I wipe it off! Your lips still feel slightly tingly and fresh once it's removed too. awe karen thanks for this tip. We were out last night and my friend was complaining how dry her lips were so now Im gonna tell her about this. I can relate on the chapped lips thing, and also the minty lip balm thing, hahaha. Finally a post about good chapstick! Lipgloss really doesn't help sometimes.